Our family is reunited – we are home in Florida! Tuesday December 30, 2014 16,000 miles, 21 hours flight time plus another 12 hours in airports. I went to sleep at 7 pm and now at 11 pm I am wide awake. 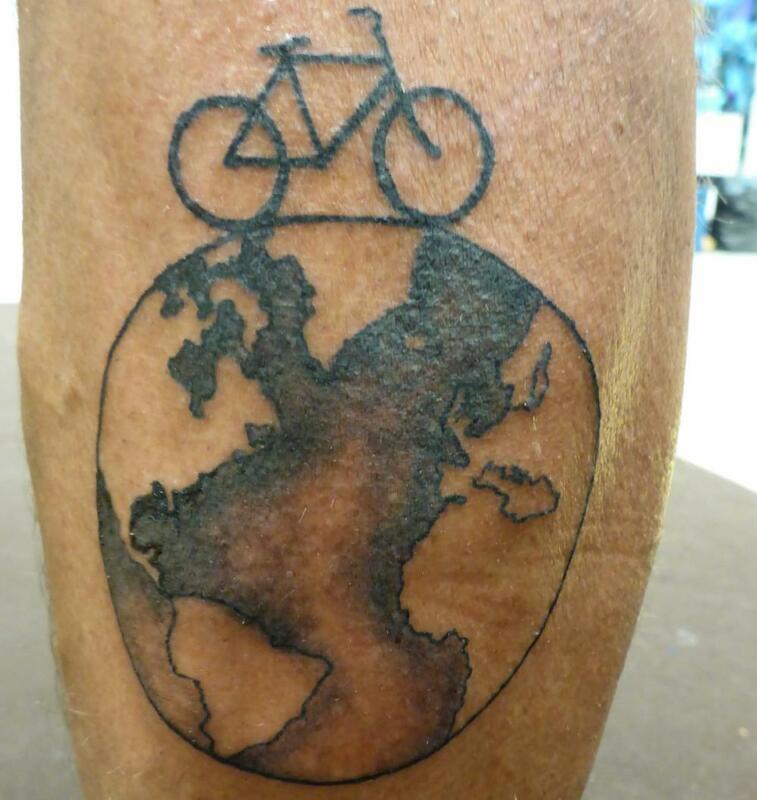 The cool thing about this is we have travelled around the world by air and bike this year. 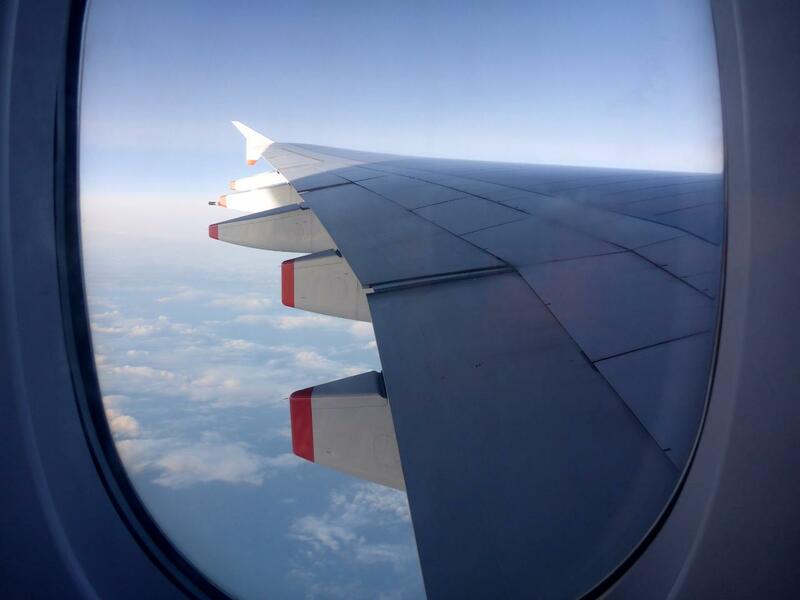 We left Orlando, Florida February 11th this year, flew east to Marrakech Morocco, biked to Thailand across Europe and Asia, and flew east back to Orlando on December 28th. Our first night in Bangkok was spent in the Swana Bangkok Hotel which is in an excellent location if you like the old town parts of cities. 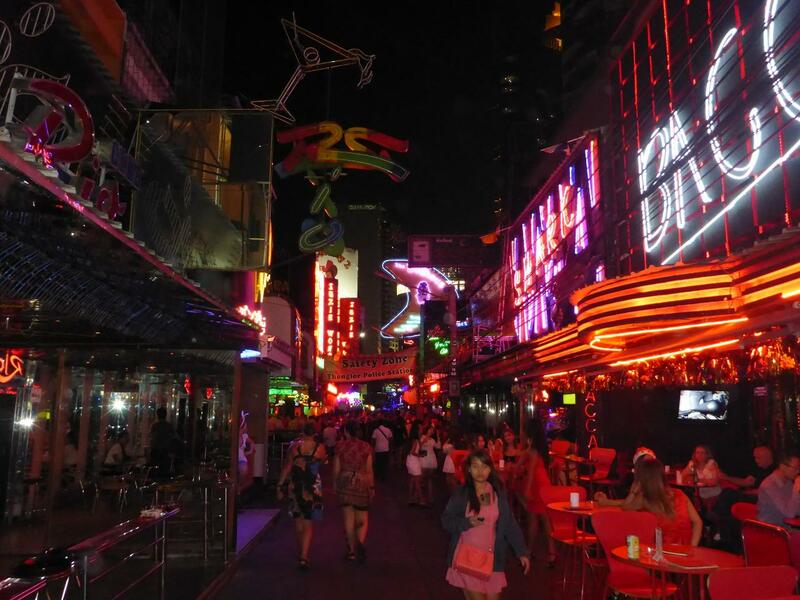 There is a large selection of hostels, guest homes, excellent tiny restaurants and bars in this area. 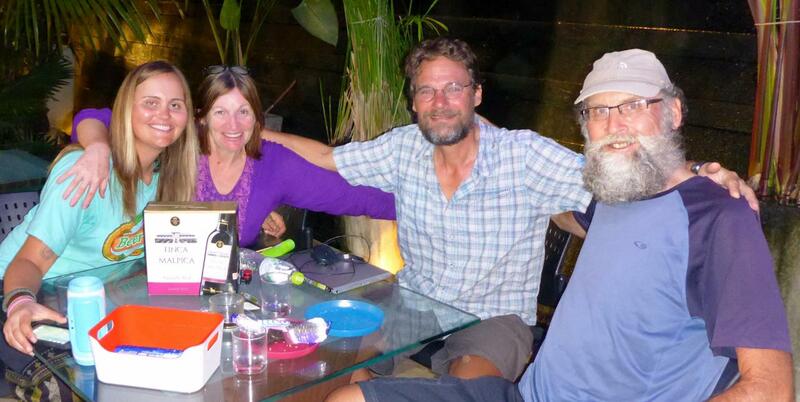 We enjoyed another wonderful Thai dinner with our Swiss friends Beatrice and Peter. 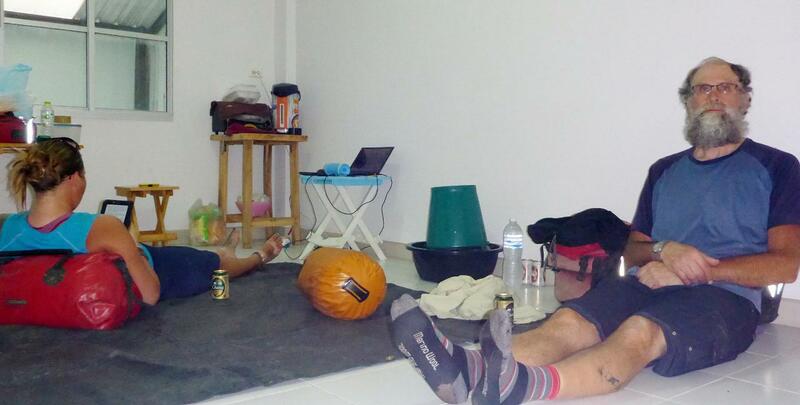 The next morning we cycled 1 ½ hours to the other side of Bangkok to stay at a warmshowers host empty apartment. If it wasn’t for the friendly and courteous Thai drivers it could have been a rough ride. Our host greeted us then gave us the key to a three story apartment. It was empty so we basically camped. About a ½ mile away there were plenty of stores and restaurants. Jocelyn’s “maps with me” app showed several local bike shops that we visited. 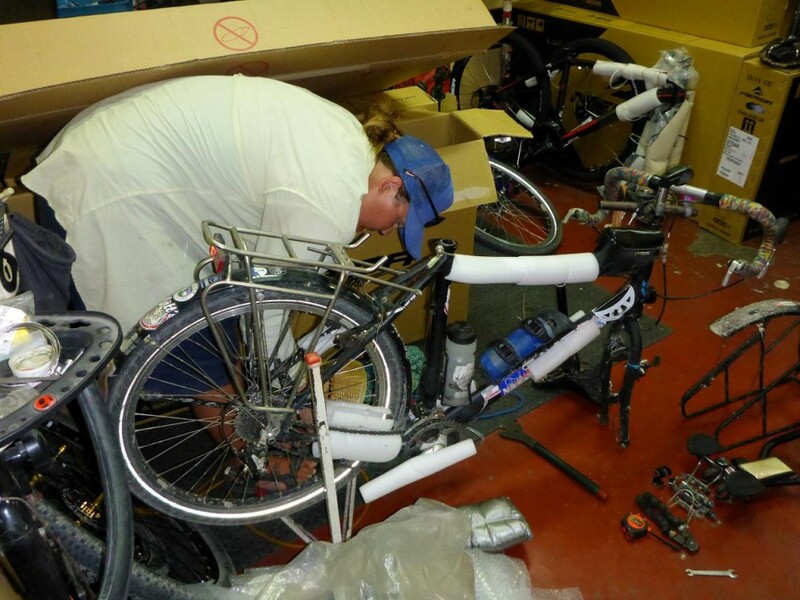 The 3rd one was the charm as it had bike boxes available and several employees that helped us disassemble our bikes for packing. 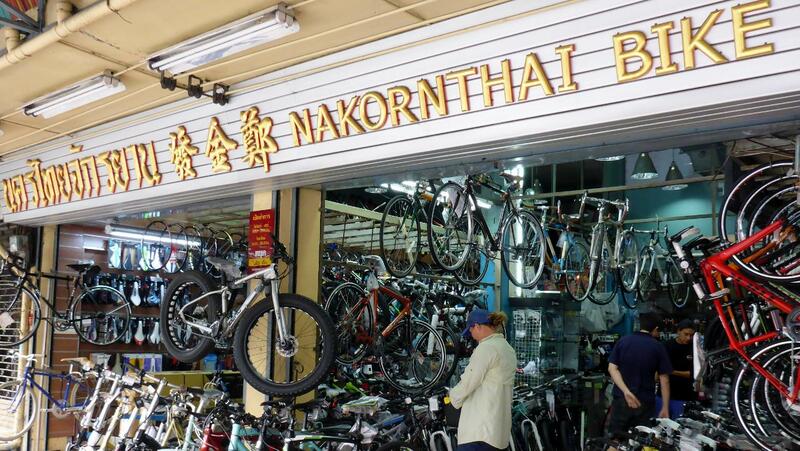 We can’t say enough about the Nakornthai Bicycle shop (http://www.nktbike.com/) due to their excellent service, on Christmas Eve, and also a complete bike shop for repairs. 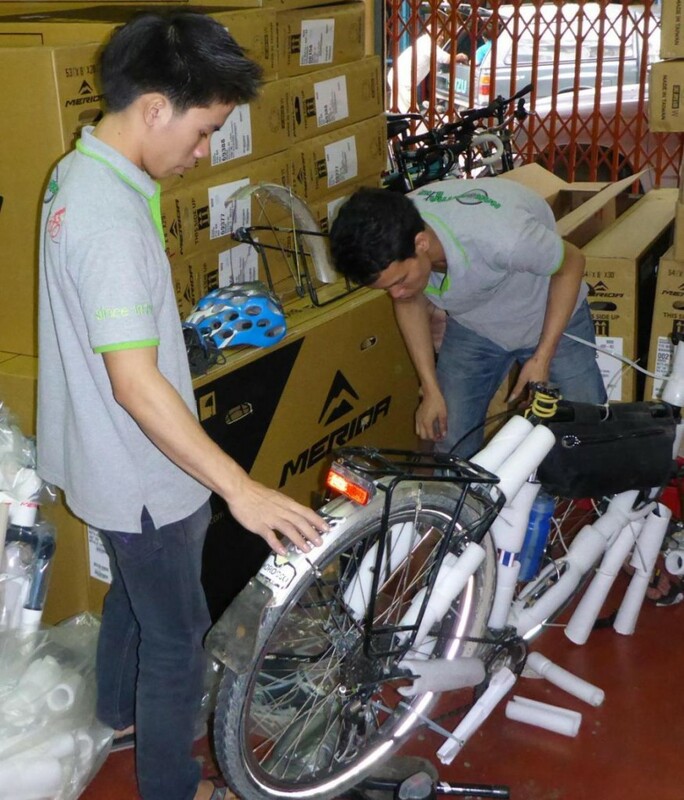 Our bikes were soon expertly packaged (for 600 Bahts (about $20)) and they arranged for a Tuk Tuk to transport us back to our apartment. Back at the apartment we were soon lost in thought as the realty hit home – our bikes were boxed so the cycling was done. We were somewhat bummed about this on Christmas Eve and were missing our family as we settled in for three nights. 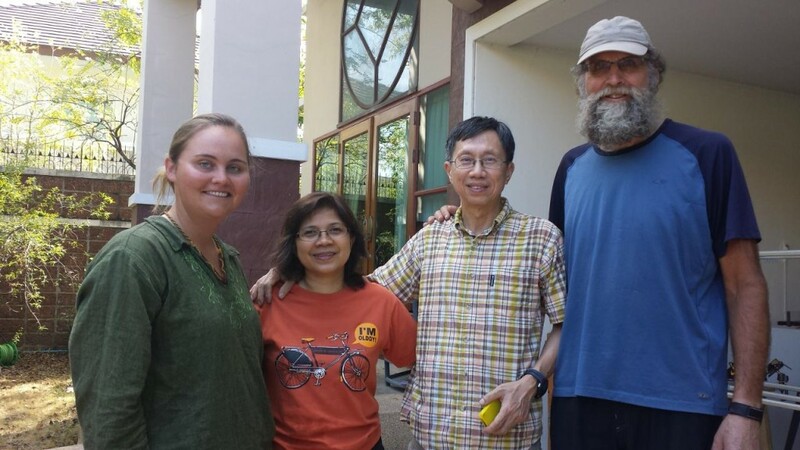 Jocelyn’s friend who is working in Cambodia as a cook soon appeared after a 10 hour bus ride. The three of us went out to celebrate with a fine Christmas Eve Thai meal. We knew this food was going away soon so that is all we ate for the rest of our Bangkok days. Christmas day morning found us going through all of our panniers and getting rid of unneeded things now instead of when arriving at home. Many bicyclists stay at this warmshowers location so we left lots of stuff. The afternoon found us at the MBK Bangkok Mall which is simply gigantic but extremely interesting and entertaining. 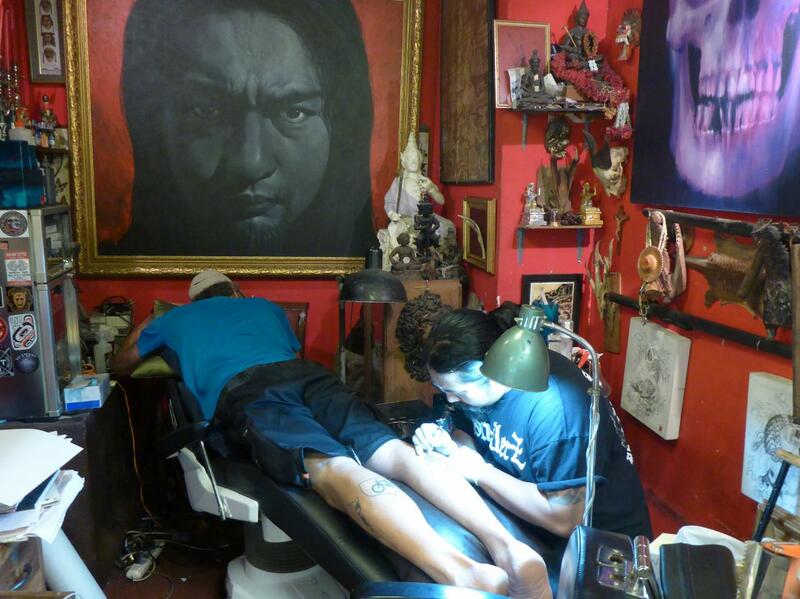 Our goal for the three of us was Christmas Day tattoos and also a bit of partying. 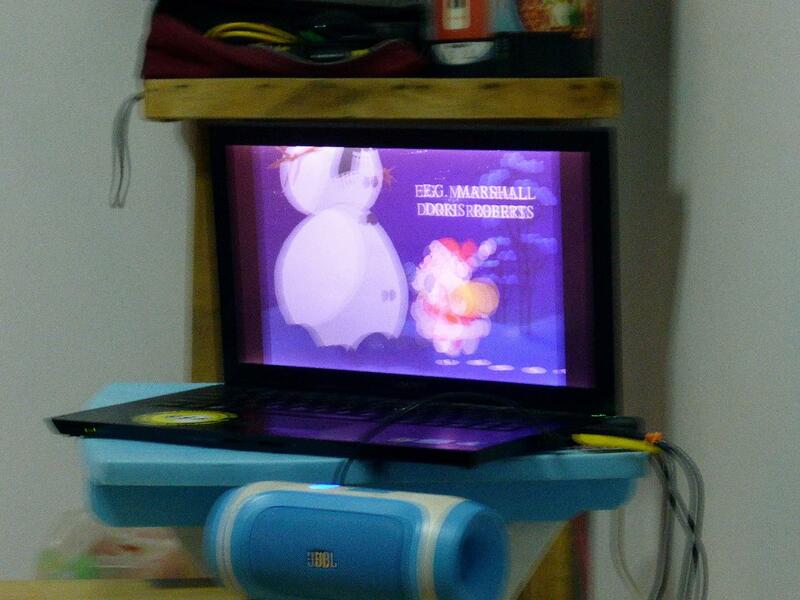 We accomplished everything for a very memorable Christmas celebration. What a great time! The next day we continued sightseeing Bangkok through the excellent Metro and Skytrain public transportation systems. We were in shock as the rest of the world will push and shove to egress and ingress the trains and subways. But the Thais are very courteous and wait in lines, yes – lines, unlike everyone else in Europe and Asia that shove. We were so impressed and of course followed along. The patient and courteous system does work. 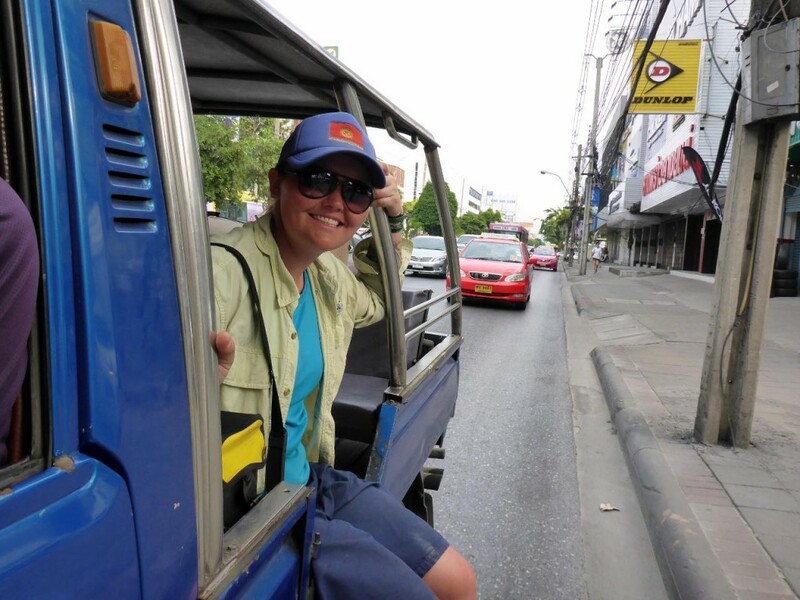 On Saturday Rachel hopped on a bus for her return to Cambodia and we found a ride to our next warmshowers host near the airport. 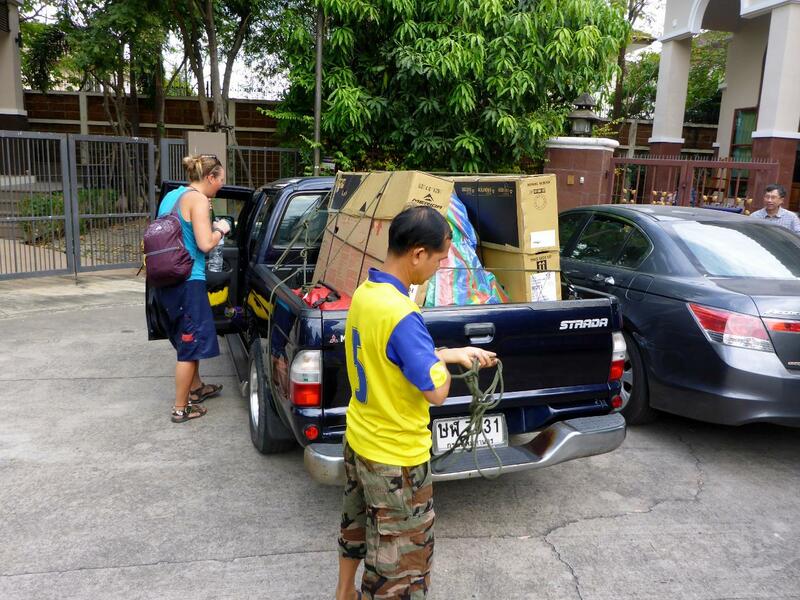 We were the first to stay in Joe and Noi’s beautiful home only a few miles away from Suvarnabhumi Airport. They treated us to our last Thai meal at a Buddhist Temple restaurant and we tried many of the foods we have never attempted and we very pleased with the selections made by Joe and Noi. What a memorable feast! 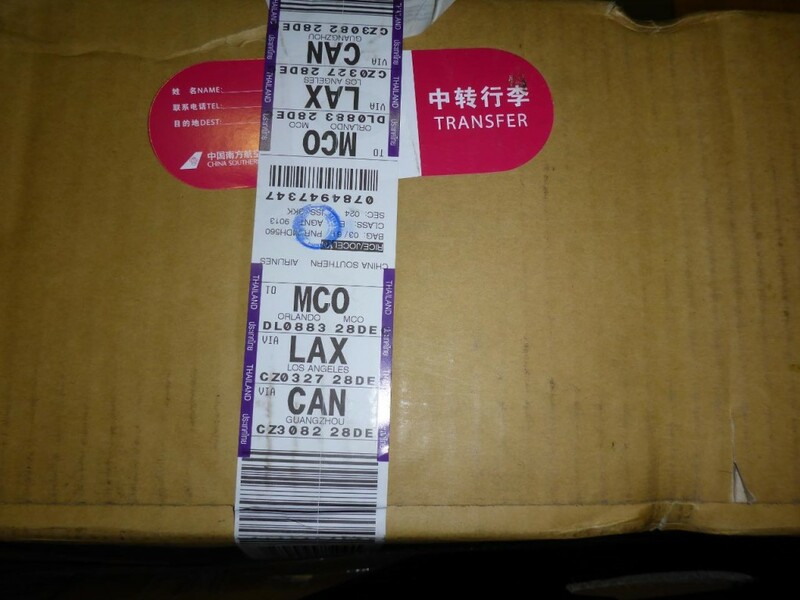 The next day we traveled by another truck, arranged by Noi, to the airport and checked in at the Southern China Airlines counter. 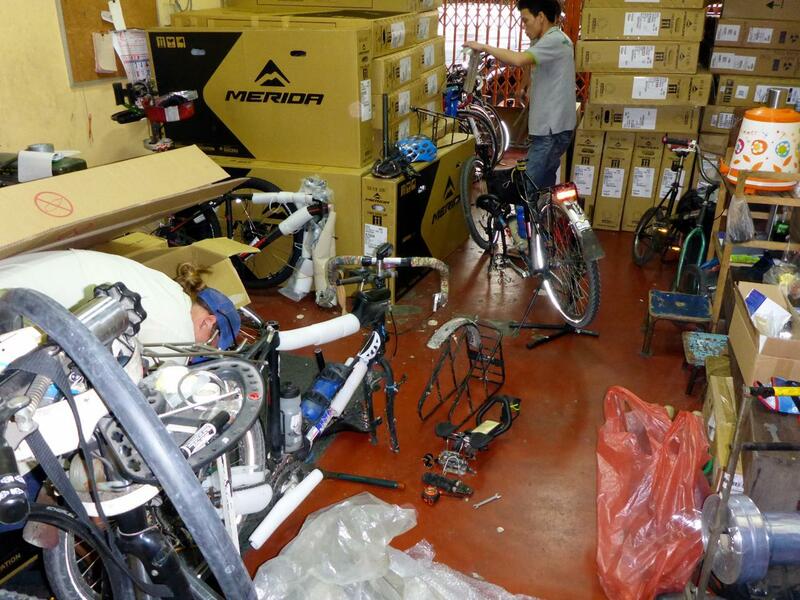 We had all of our panniers and trunk bags enclosed in 4 larger zippered plastic bags along with our two bike boxes. We were allocated two bags a piece and paid a total of $300 for the two additional items. The flight to Guangzhou, China (near Hong Kong) was on time where we then waited a few hours to board our Southern China Airbus 380 for the flight to Los Angeles International. 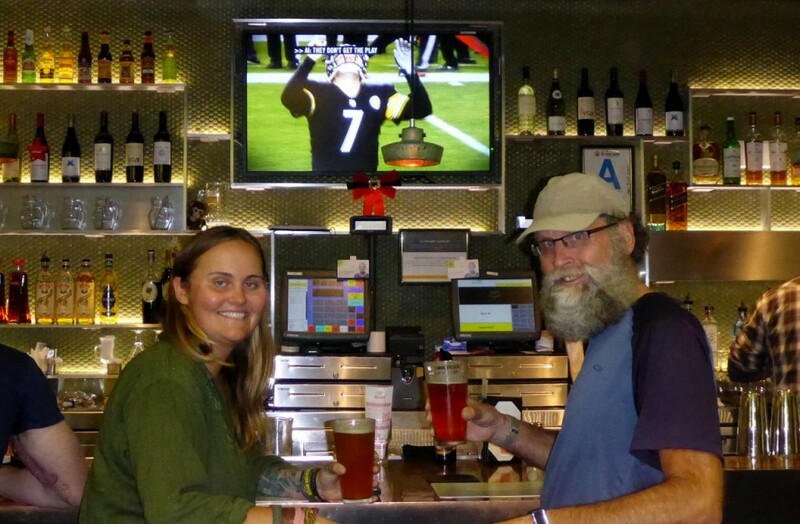 We knew we were back in China when a bar waitress loudly said “YOU PAY NOW”, immediately when ordering two beers. Too funny! The flight to LAX on the largest commercial aircraft in the world, Airbus 380 with 506 passengers, was pleasant with plenty of room. I have travelled on this aircraft a few times with my Antarctic adventures while flying to New Zealand. I was able to sleep but Jocelyn didn’t. The key is a window seat as there is plenty of room from the seat to the bulkhead. I offered to switch with Jocelyn but she declined. After arriving in Los Angeles we were required to pick up all of our luggage and go through customs then recheck the bags through Delta to Orlando Florida. 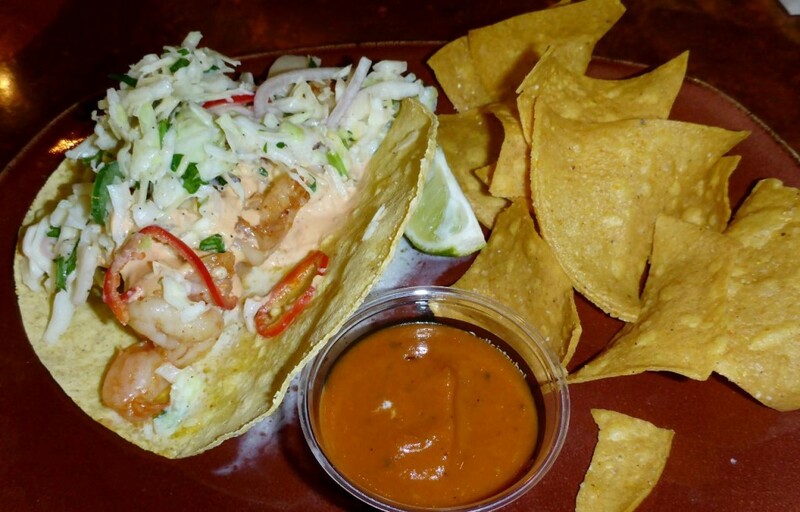 This went very well as the LAX International Airport has a transfer service to domestic Airlines. I have read many blogs where people arriving back to the U.S. recheck their bags and are required to pay again. We were expecting to pay another $600 ($150 x 4) as Delta only allows one checked bag for domestic economy. But everything transferred successfully! This was a real bonus as our flight home from Bangkok was only $700 each along with $150 each for excess luggage. Quite a deal – thanks Jocelyn! Everything arrived, although the bike boxes were pretty beat up and all the straps missing, when my wife and son, Andee and Cary picked us up. Now we are going into the long process of unpacking and settling back in our home for a few months. Out of the last 39 months I have only been home for 5 months between my Antarctic positions and bicycle touring. I am ready to become a husband and father again. 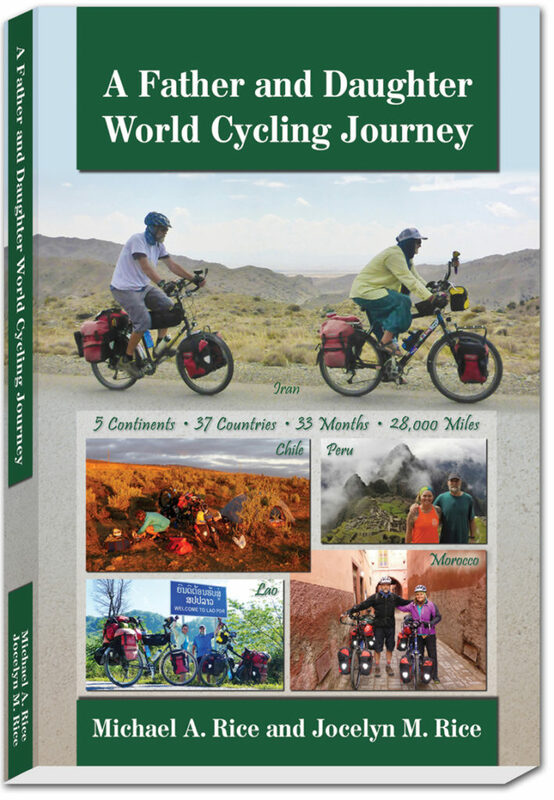 I will write a summary of our ride as soon as I can settle down and also begin planning the next portion of our world tour starting in May 2015– Alaska to Ushuaia, Argentina, the capital of Tierra Del Fuego about 19,000 miles. 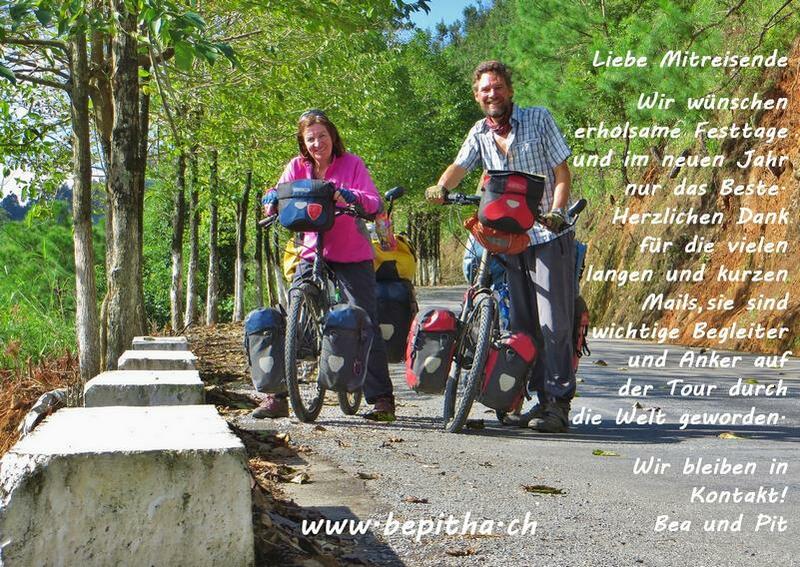 Our Swiss cycling friends Beatrice and Peter. What a pleasure to meet up with them again in Bangkok. 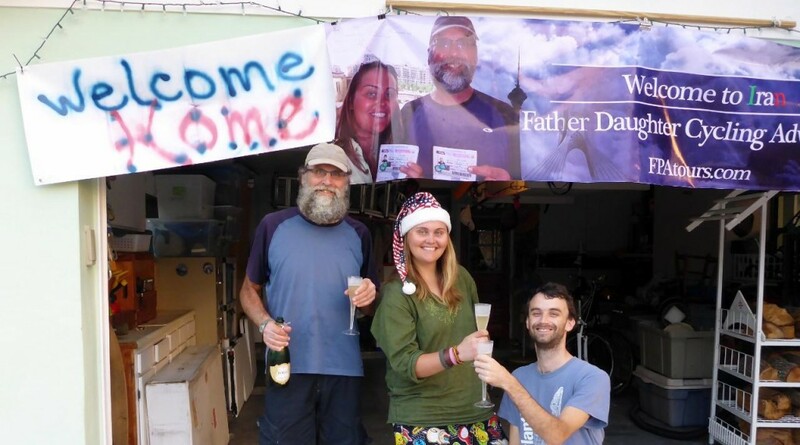 They will backpack with their daughter in Cambodia for three weeks then cycle to Myanmar. How exciting! We worked alongside them to make sure the packaging was done to our expectations. Our Tuk Tuk ride back to our apartment on Christmas Eve with our boxed bikes. Not much room to sit. Christmas Eve in our empty apartment – a bucket of beer and snacks with Jocelyn’s friend from Cambodia soon to arrive. Contemplating the end of the ride while listening to Joe Cocker who just passed away at 70 years old. R.I.P. Joe. 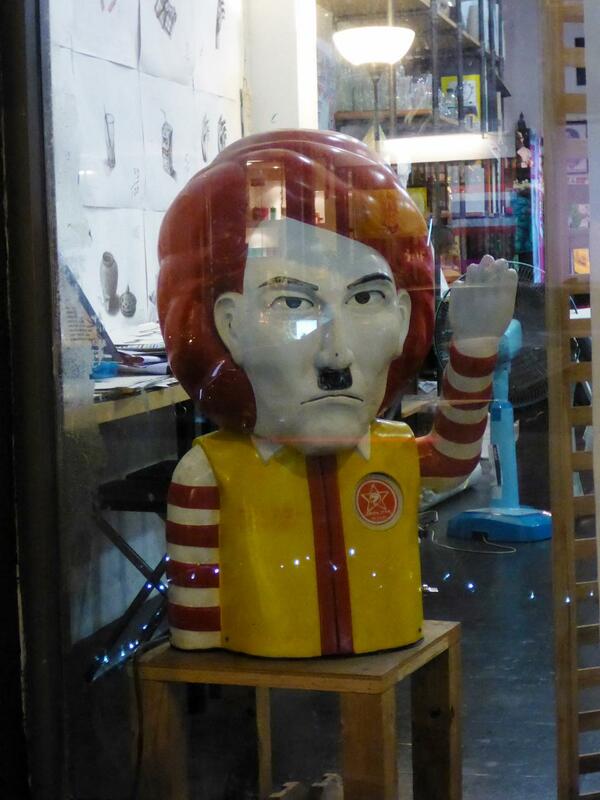 An interesting artist’s rendering of Ronald McDonald. 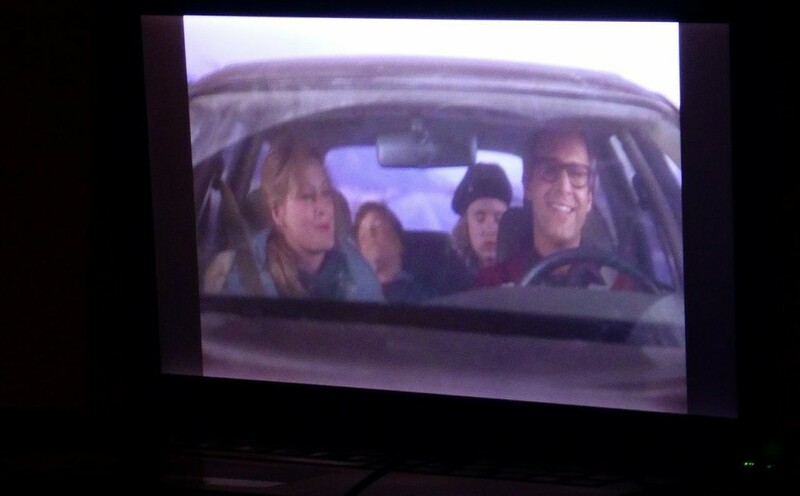 Keeping the Rice family Christmas Eve tradition alive, watching Christmas Vacation with Chevy Chase. What a classic. I still laugh throughout the entire movie. Jocelyn was really surprised and happy that I had a digital copy. 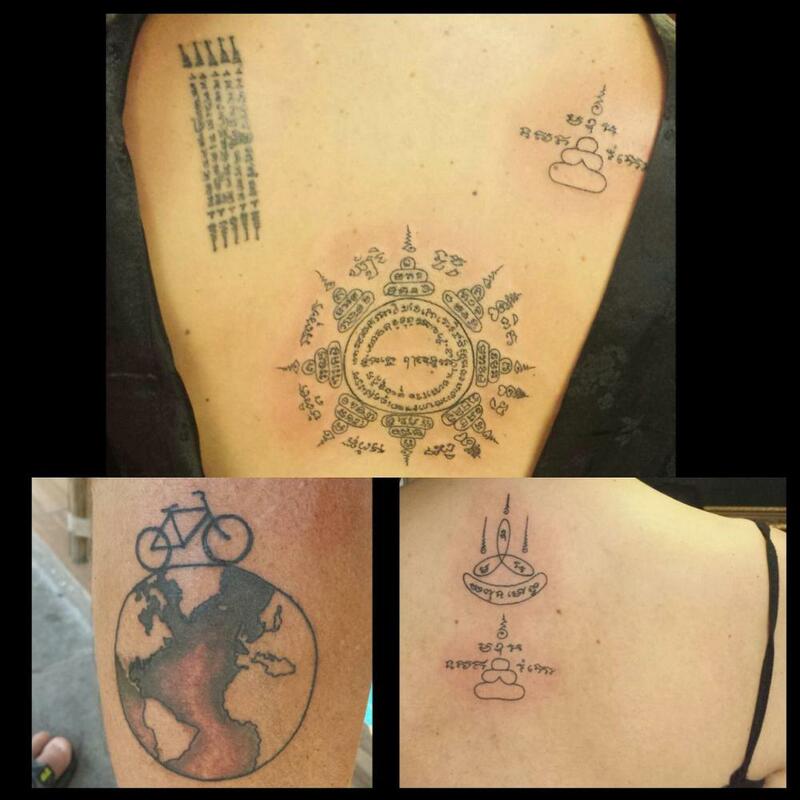 A bicycle ride around the world from a Bangkok tattoo artist. What a memorable Christmas. All three of us were tatted. Jocelyn on the top, Rachel bottom right and me bottom left. Rachel and Jocelyn also received the “same, same”. 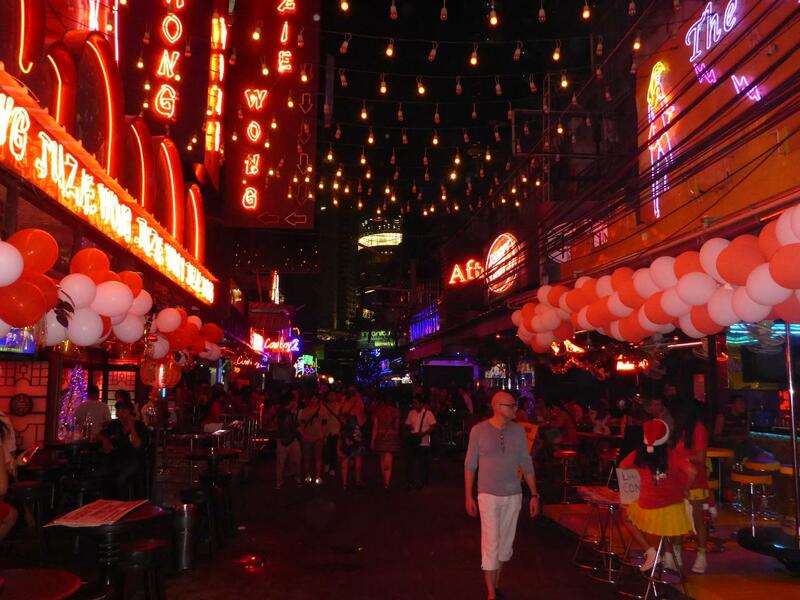 The Soho District (Red Light District)of Bangkok. We had a few beers here and watched the action. It was very entertaining to say the least. Yes, it is legal. The next day we traveled back across Bangkok for an excellent Mexican meal with Beatrice and Peter. Rachel in front. Closer to us the remains of a Christmas Day bar party. Jocelyn found this gentleman who helped us transport all our stuff to our next warmshowers host. Noi and Joe live just a few miles from Suvarnabhumi Airport. A very nice and generous couple. 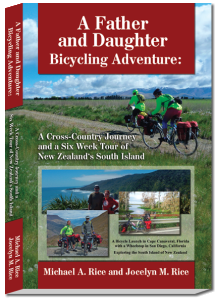 Joe and his son have cycled around Southeast Asia. 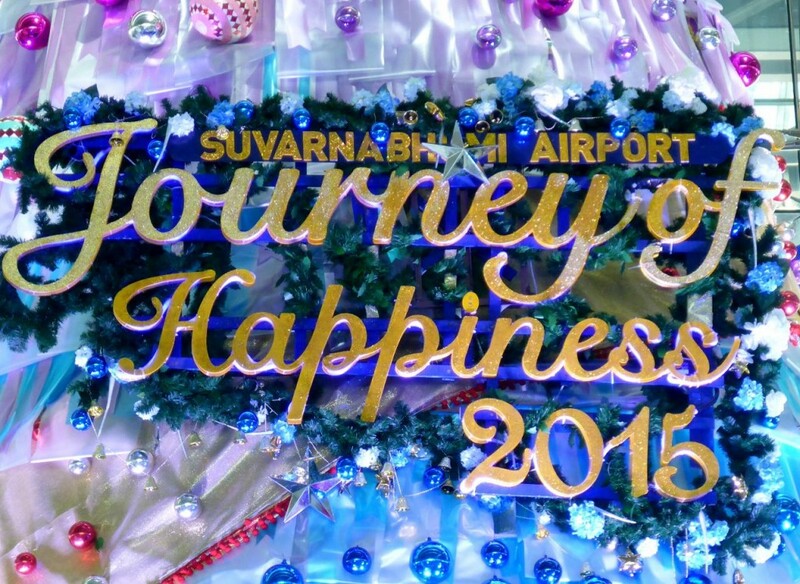 What a great saying from the Bangkok Airport. The wing of an Airbus 380 is very long. 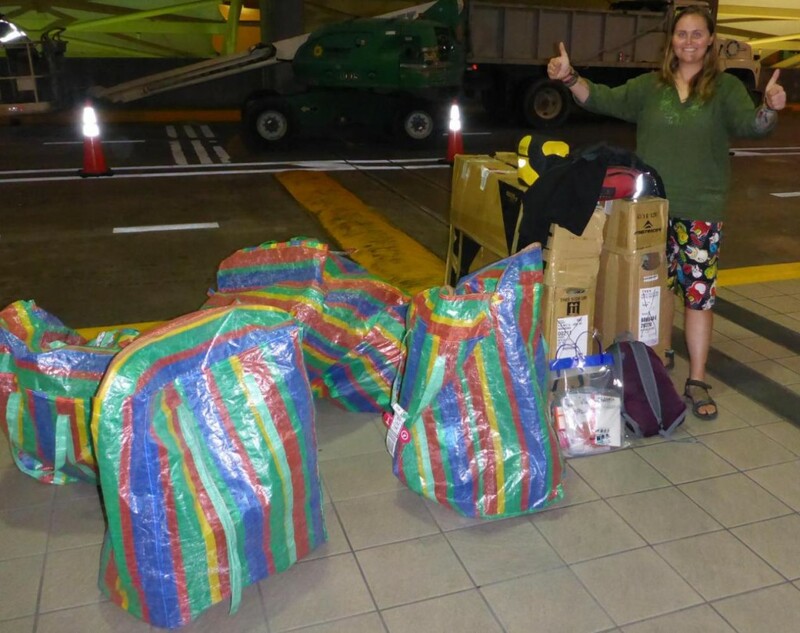 Everything arrived in Orlando Florida intact after 16,000 miles and 33 hours. The key to a correct transfer without having to pay again for the domestic flight – a red transfer tag. Together again – Andee, Jocelyn, and Cary. 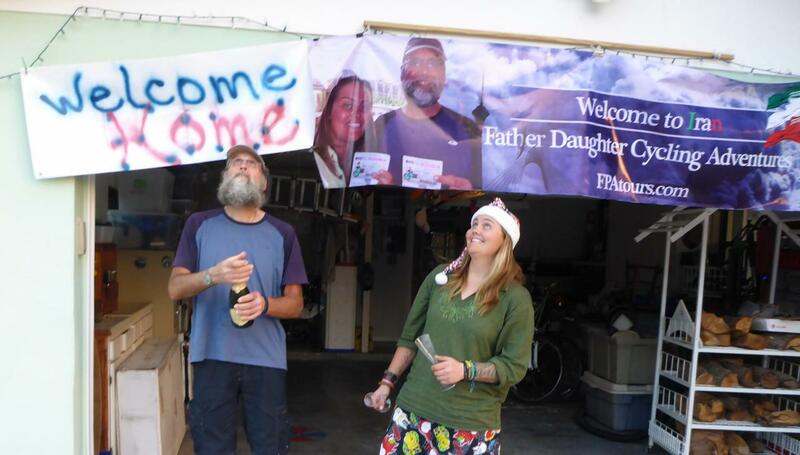 Welcome home signs and champagne! It’s been a long time coming. Happy reunion! My wife, Andee. And of course Jocelyn’s dog, Yaki. Shortly before we left one of my two dogs passed away followed in April by my other dog. A bittersweet reunion for me. Jocelyn mapped our world tour thus far and added her Transamerica trip along with her other solo trips. The gaps in Asia are from 2,200 train miles in China across the Gobi Desert. We train toured for the first 1 1/2 weeks in China then cycled the rest of the 30 days allocated to us.